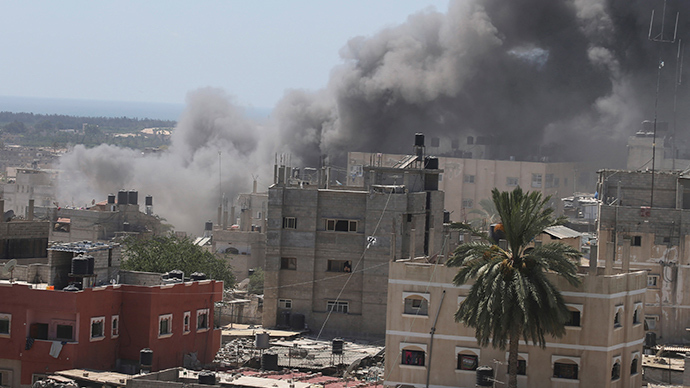 A ground operation in the Gaza Strip has been launched by Tel Aviv following more than a week of Hamas shelling the country and the IDF responding with air strikes. Over 200 Palestinians and one Israeli have died in the violence. Israeli premier Benjamin Netanyahu has stated that the military action will "intensify" after an Israeli boy was killed by fire from Gaza. The four-year-old died in a mortar attack on a southern Israeli village close to the Gaza border. On Friday, at least five people were killed in Gaza in IDF bombardments, Palestinian officials stated. Over 2,000 Palestinians, the majority of them civilians, and 67 Israelis have been killed over the last few weeks. A new 72-hour pause in hostilities was negotiated with Israel, according to the AP. The Egypt-proposed model was accepted by Hamas and comes on the heels of renewed fighting and other failed international attempts at ceasefires over the past month. Israel launched 30 strikes on Gaza on Saturday, killing five Palestinians. A 10-year-old boy was among those killed. Two Palestinians were killed when their motorcycle was bombed, and the bodies of three others were found beneath the debris of one of three bombed mosques, local medics said, according to Reuters. Three houses were also targeted on Saturday. Israel won’t send envoys to Gaza ceasefire negotiations planned in Egypt on Saturday, an unnamed Israeli official told Reuters. An Egyptian-brokered ceasefire on Friday broke down within hours, with Israel and Hamas blaming each other. A Palestinian delegation, including Hamas representatives, was due to arrive later on Saturday in Cairo for new talks. French President Francois Hollande condemned the Wednesday morning shelling of the UN school in Gaza, which killed at least 20 people AFP reports citing the statement of the Elysee Palace. "The French president agrees with the Secretary General of the United Nations Ban Ki-moon, who considers this measure unjustified," said the official statement, adding that "France calls for the immediate introduction of the ceasefire."